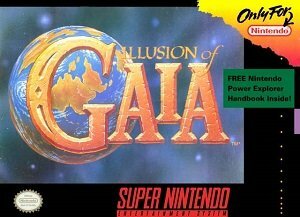 Cheats, Tips, Tricks, Walkthroughs and Secrets for Illusion of Gaia on the Super Nintendo (SNES) We also have PRO Action replay and game genie codes. If you need further help with Illusion of Gaia you can post a message in our forums asking for help. Red Jewel Rewards – During the course of the game, you can find up to 50 (sometimes missable) Red Jewels. By collecting them and giving to Gem the Jeweler, you can get additional rewards alongside the secret mansion in “Unlocking Gem’s Secret Mansion” cheat. Secret Level – Once you obtain all 50 Red Jewels, talk to the Jeweler. Pick the final option to be transported to a secret level containing many diffucult enemies not found anywhere else in the game, and a secret Boss, Soul Blazer awaiting you at the end. Become Shadow and use Aura – Get to the Pyramid (which is right after Dao). When you are in it, you will see a dark space portal. Enter it and become the new character. Talk to Gaia. He will give you Aura. Press B to use Aura. You will have to see small stones under the floor.